(Bloomberg) -- It’s as good a time to buy BBB bonds as it is to be a BBB rated borrower. The cheapest funding levels seen in more than a year have driven heavy issuance among companies rated in the lowest tier of the investment-grade market this week, with about $19 billion of the week’s $28 billion of supply coming from BBB borrowers, according to data compiled by Bloomberg News. This comes after a dovish pivot by the Federal Reserve and weak global economic data that drove a rally in Treasury yields. Low borrowing costs are a benefit to lower quality issuers who risk having to refinance at high rates if the economy turns sour or if they get downgraded to junk. 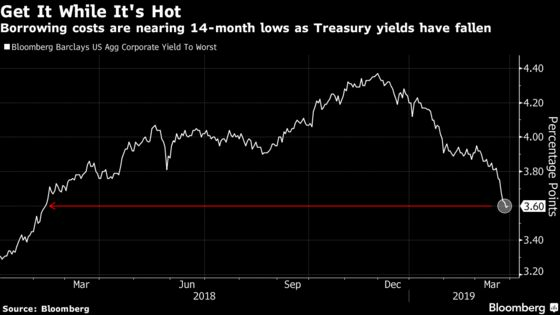 Last quarter, economic weakness gave investors reason to worry that the bonds were going to get hit by a wave of downgrades, or become so-called fallen angels. With BBB rated bonds set to have their best first quarter since 1995, the demand has been there to meet the supply. The high-grade primary market has performed strongly this year as borrowers have consistently garnered strong demand for their deals and paid low premiums to sell new debt as compared to last year’s averages. Broadcom Inc., a company rated one notch above junk, took advantage of investor appetite for the ratings tier Friday, a day that is normally characterized by light activity in the primary market. The borrower is expected sell as much as $11 billion of debt, nearly doubling what the company initially targeted, according to a person familiar with the matter, who asked not to be identified because the matter was private.